I’m somewhat embarrassed to admit that Hallie’s room still hasn’t been painted since her insulation fiasco last August. I have to explain to everyone why there is a large patch of drywall along one whole wall. I meant to paint it sooner. But I wasn’t quite sure if we were sticking with blue or choosing a new color and quite frankly it was out of sight out of mind. But like most unfinished projects, at some point I get annoyed that I’m having to take it off a list (because everything else on the list was completed) and write it again at the start of a new list. 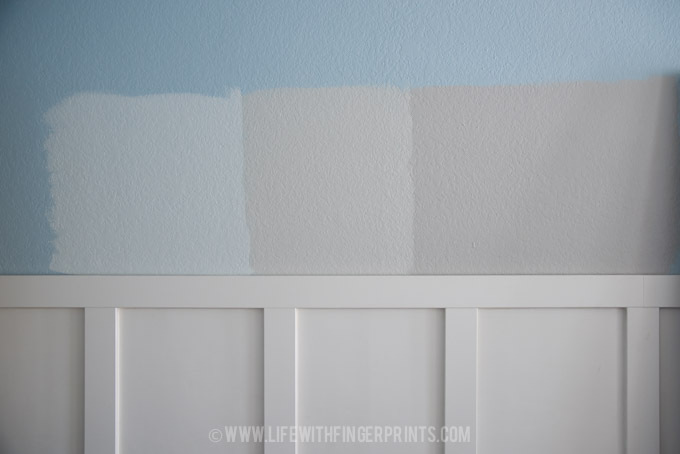 I’m tired of writing, “Paint Hallie’s room”. I’ve made it my goal to get it done before school gets out which I thought was completely realistic until I tried deciding a color. I painted two of my very favorite grays (the two on the right) that I’ve used in other rooms and they just didn’t work like they have in other rooms. It was as if they were a completely different color. So I rushed out on Saturday morning and grabbed a new sample (on the left) – a color I’d seen in a friend’s house and I was sure it was the color I would use. I painted it on the wall and it wasn’t dark enough. I painted the samples on other walls just to see if the lighting made a difference. (notice the patched drywall above the samples!) I wasn’t sold. I went out this morning and grabbed two more samples – less gray and more aqua in color. (Hallie’s choice). I should have known better than to grab a sample from home depot – I’ve never had luck when they try to color match from someone else’s book. Both the samples went up and I think we might have found a winner. The problem – I had them match another brand and they completely botched the color match…but we actually like the botched color. 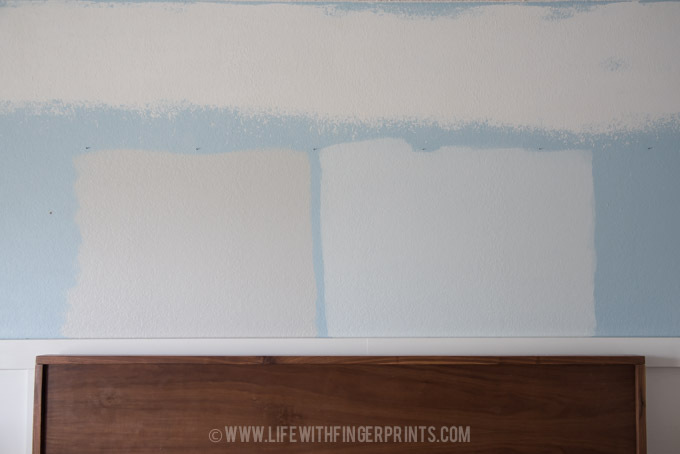 So now I’ve got to figure out how to get Dunn Edwards (where I buy all my paint) to match the botched color from Home Depot – which was trying to match an original Dunn Edwards color. Confusing to say the least. Hopefully we can figure it all out because I’m afraid if we don’t get this room painted soon it’s going to look like this until summer ends! I would love to know What your go to grays are? I love Dunn Edwards Foggy Day, Benjamin Moore Gray Owl (We have it at full strength as well as 50%) and Benjamin Moore Stonington Gray. Grays can be tricky – those colors seem to work well with the natural light and overhead light we have in our house. I have many friends that have Foggy Day and it looks different in everyone’s house!